14ymedio, Marcelo Hernandez, Havana, 4 May 2017 — Early Wednesday morning Karel wasn’t sleeping. He spent it turning somersaults in bed and solving math problems. Together with thousands of students across the country, the young man presented himself at the Mathematics entrance exam for higher education. “It was complicated, but I answered all the questions,” he said smiling to his mother as he returned home. As of this Wednesday, high school classrooms are filled with nervous gestures and students who are playing with their professional future on a piece of paper. Most have been preparing for this moment for months, and many have had to pay for a private tutor who prepares them to successfully pass the tests. “I’m a little anxious, but I feel safe because I’ve studied a lot,” said a twelfth grader from Old Havana minutes before the buzzer announced the start of the first entrance exam. My strength is geometry and I didn’t like the problems at all,” he confessed. The Mathematics exam started off the admission tests for Higher Education throughout the country. More than 45,000 high school graduates took part, the young men after finishing their Active Military Service, and the girls who completed Women’s Voluntary Military Service. Other applicants take the tests through competition. All, without exception, set their sights on continuing higher education in a country where university diplomas are less valued every day. Between 2010 and 2015 the number of university students fell by more than half: from more than 206,000 students throughout the country to 90,691. The causes for this decline are manifold and the specialists do not agree, but economic imperatives are among the incentives for an increasing number of young people to prefer to go to work as soon as possible. The situation contrasts with the massive admissions to higher education that characterized national education for decades. Previously, tens of thousands of professionals graduated, many of whom are now engaged in occupations not related to their specialties. Finding a chemical engineer working as a bartender in a hotel or a biochemist driving a private taxi has become a “normal anomaly” in the Cuban system. “My family cannot afford for me to be in a classroom for five more years,” says Rodney Calzadilla, 18, a food vendor in Matanzas province. The mother of the young man has a degree in Economics, but she “always told me that the most important thing is to be useful, not to have a diploma hanging on the living room wall,” he says. 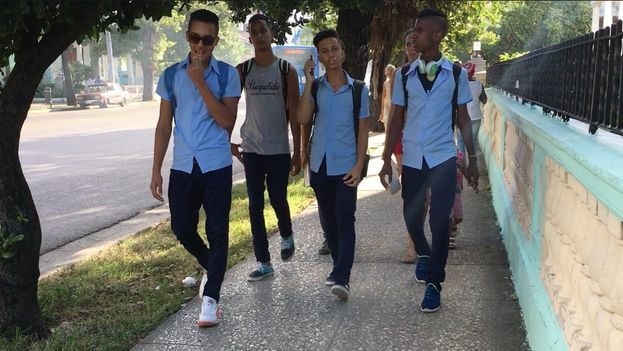 Of the 539,952 Cubans who worked in the private sector at the end of January of this year, or for themselves, more than 3,000 are under the age of 20. At the conclusion of the exams this May, the list will be drawn up, which also takes into account the average of students’ grades in high school. Those with the best grades and test scores have priority to choose one of the 83,840 places in higher education that are offered for the 2017-2018 school year, of which the most desired by young people are the 36,705 in the regular day course. But the entrance exams are complicated. In June 2014, a fraud scandal shook the most important tests in Cuban education. The incident involved five pre-university teachers, a provincial-level methodologist at the Ministry of Education, a print shop worker, and another citizen not linked to educational institutions. A year later they returned to the eye of the hurricane, when the Ministry of Education recognized that “the approach of the question 4 of the examination of Mathematics” was subject “to several interpretations.” Faced with the massive complaints from the students, the authorities were forced to evaluate only section A, discarding section B. Next Monday, the Spanish test will be administered and the calendar concludes on Thursday, May 11 with History, the most ideological subject in the curriculum of the schools of the Island. For the History exam the students are preparing themselves on this occasion on subjects related to the deceased ex-president Fidel Castro. “What goes, goes,” says María Julia, a teacher of the specialty that organizes private tutoring in Havana’s Playa district.